Vitra LCW Mini Eames Chair 1945 Miniature. 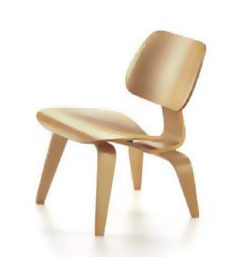 Charles and Ray Eames "Model LCW" plywood Chair. 1:6 Scale LCW Chair. Made according to the exact specification of Eames. This is a Vitra original miniature chair. This amazing and highly detailed miniature is an exact copy of the original large version! The miniature comes in a wooden box with a brochure which provides art-historical information on the background to the design, biography of the designer, and the production history of the respective chair. Miniature LCW, designer: Charles and Ray Eames, designed in 1945. The furniture designed by Charles and Ray Eames is a successful synthesis of formal and technical innovation. For every new design, they also developed the necessary production technology for industrial production. In the Plywood Group of 1945 they first put into practise their technique for producing three-dimensional plywood forms. Size: 6.3" x 4.13" x 1.94" (16 x 10.5 x 11.5 cm).